As a loving, dedicated dog owner, your best friend’s health and happiness are always a priority. Sometimes, though, life gets in the way and it’s hard to find the time for even a short walk. But what can you do? Dogs in Action can help you unleash the potential in your dog’s body and mind – in as little as 15 fun minutes a day! 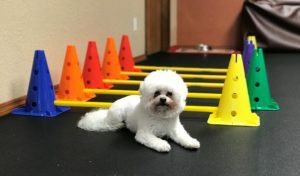 With expert guidance from Ann Howie – the only Certified Canine Fitness Trainer (CCFT) between Portland and Seattle – you’ll learn how to lead your dog through a series of short-but-effective exercises tailored to both your needs. Whether you work together at home or in our clean, comfortable center, you’ll be amazed at how quickly your dog responds and how much fun you both have. We help in these ways . . . . 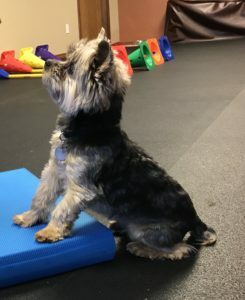 Whether you have an active athlete or an idle companion, small-group classes are an effective, affordable way to improve your healthy dog’s overall fitness, flexibility, and strength in a fun, friendly, and supportive environment. Dogs crave exercise, and getting exercise can reduce problem behaviors at home. When we say small, we mean only three dogs and handlers. (Although a dog may have more than one family member present.) One night a week you meet with other people with similar interests and goals to work with your dogs together for one hour. Pre-registration is required. Note: These classes are designed for non-injured dogs. For those who who prefer the personal touch of one-on-one attention, private lessons are more your style. Your first step to a healthier, happier dog begins with scheduling an initial consultation with Ann. 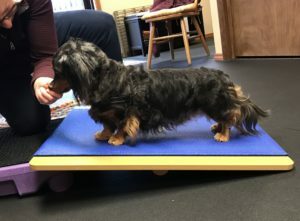 During this consultation, which lasts up to one-and-a-half hours, Ann will meet with the two of you to conduct an assessment of your dog’s current fitness level and abilities. She’ll also talk with you about your concerns, learn about the goals you have for your dog, and answer any questions. Your dog is not required to stay if he becomes tired or seems stressed. Following the consultation, Ann will take some time to think about your dog’s particular needs and develop a plan specifically for you and your dog. Ann will then send you your customized Plan of Action. Once you’ve received your Plan of Action, at least one one-hour follow-up session with Ann is highly recommended. 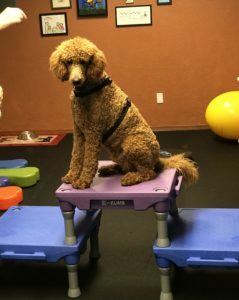 In this session, Ann will go over the Plan with you and help you safely take your dog through the exercises. This will ensure that you feel comfortable working with your dog at home and that your dog is using good form. After the first follow-up session, you’ll work with Ann to determine the frequency of future sessions, if needed. 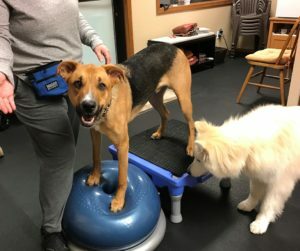 As your dog becomes stronger, your Plan of Action will be adjusted to his changing needs by increasing difficulty, presenting new challenges, offering modifications, and ensuring that he keeps having fun! Between sessions, Ann is always available to answer questions either by phone or e-mail. To learn more about what to expect at your appointments or to get started, Contact Us. If it’s hard enough to find time in your busy schedule for your own exercise routine, much less your dog’s . . .
Let Dogs in Action exercise your dog for you! We’re not talking about a leisurely stroll around the block here. At least twice a week – while you’re at work, school, or tending to other commitments – we will come to your home and get your dog moving! 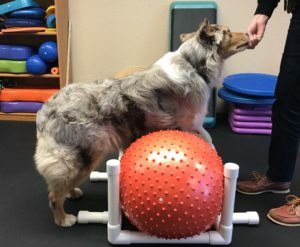 Ann Howie – the only Certified Canine Fitness Trainer (CCFT) between Portland and Seattle – will safely lead your dog through an individualized conditioning exercise program designed to improve strength, balance, flexibility, coordination, and cardiovascular health. You can relax knowing your dog is in caring, experienced hands, having a great time, and getting more fit by the minute. Ann will first meet with you in your home and assess your dog’s abilities and needs. Afterward, Ann will develop an individualized Plan of Action especially for your dog. Then Ann will come to your home twice a week for 45 minutes each session. Ann will check in with you at pre-determined intervals to keep you advised of your dog’s progress, make changes when necessary, and answer questions. Ann can also show you how to do exercises with your dog. 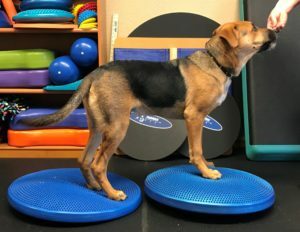 For dogs who need a weight-loss program or for those who are unable to give their dogs a cardio workout, Dogs in Action also offers canine treadmill time in our center. First, we’ll spend one or more sessions training your dog how to use the treadmill safely and comfortably. Once your dog is happily walking or trotting on the treadmill, additional sessions can be scheduled at the frequency and duration you desire (15/30/60 minutes). Your dog will always be supervised and monitored, and he is always free to get off the treadmill at any time. Save money and make life easier through our rewards program. Private Training: After five private follow-up sessions, you receive half off your sixth session. In-Home Training: After five weeks of in-home training, you receive half off your sixth week. Treadmill Work: After five sessions, you receive half off your sixth session of the same or shorter duration. "Ann has been instrumental in helping me and my perfect dog, Archie, maintain his physical health as he ages. Ann has created multiple, personalized home routines for us to keep Archie's muscle mass healthy and youthful. This, in addition to our workouts at her center, make people in the street stop and ask how old my "puppy" is. Most folks are shocked that my almost 8 year old dog moves and looks like a teenager. In addition to creating fabulous workouts, Ann is a skilled and gifted dog trainer. She really sees and supports your dog where they are at. Shy dogs, bold dogs, dogs that might come off as a bit intense are all happy to see Ann, because she makes each dog comfortable and creates an environment where they can learn, work and grow. It is humbling to watch and participate in. Go see Ann, you and your dog will be so pleased, not only with the results, but also with the stronger relationship you will build with your dog by doing something fun!" --Margaret B. 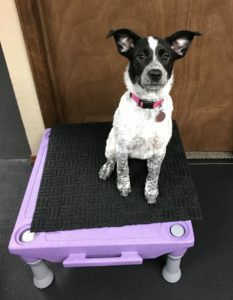 "In addition to being able to understand dog behavior, Ann's ability to work with and/or train dog parents in such a calm and reassuring way is a gift." --Cori M.
“My Pomeranian, Bubba, had recovered from knee surgery and needed some exercises to help him improve his mobility. Ann gave me the guidance, knowledge, and exercise to help Bubba on a great road to recovery.” --Julie C.